Speaking words of wisdom, let ’em pee. As any “specials” teacher can tell you, deciding whether or not to allow students to use the bathroom is a tricky thing. When dealing with elementary students in a “specials” classroom, it is hard to determine whether or not to allow students to use the bathroom. As an art teacher, I work under the assumption that the regular classroom teachers give students plenty of opportunities to use the bathroom during the day. Unfortunately, little kids with little bladders and little ability to plan ahead don’t always take advantage of these opportunities. Based on the casual manner in which Becky asked to use the bathroom and her overall bored attitude, Becky is obviously looking for a way to waste time and get out of listening to the lesson. “No” is the best answer in order to show Becky that this is simply not allowed and to discourage other students from trying as well. This answer is suitable when it can’t immediately be determined if Becky really needs to use the facilities. It also sets the precedent for the rest of the students. Once work time begins, Becky will either happily get to work, forgetting she had ever asked, or she’ll immediately shoot you “the look”, letting you know that while she patiently waited for you to finish talking, her need to use the bathroom has now reached “emergency” status. At this point you will need to be strong and stick to your guns. You will be bombarded with “but, but, but…”. Be firm and reply that now is not the time for questions. The students will then burst out with, “But I need to use the bathroom too”. Proceed with caution. If you choose to pull out answer #1 here, you will then have to listen to, “but you let Becky go.” Your best option, at this point, is to safely to fall back on answer #2 for all students. Navigating the ins and outs of bathroom use in the classroom is tricky business, obviously. If you’re lucky, you have a small bathroom located in your classroom, as I once did. I discovered, that with a bathroom in the classroom, very few students ever had to “use the bathroom,” Kindergartners aside, of course. When removing the novelty of using the bathroom in the hall and presenting students with a perfectly usable facility in the room, wherein other students might here them go, most of my students were able to take care of their business prior to class. Of course, there were always be those occasional “emergencies”. * All names have been changed. 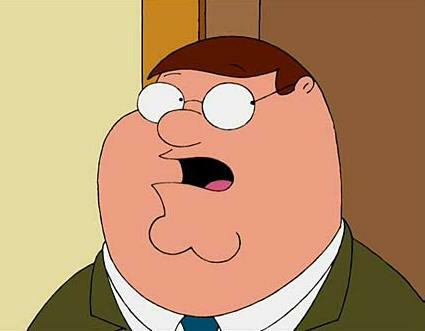 The Principal was not named Peter, but since he beared a striking resemblance to Peter Griffin, I chose to call him Peter. ** As it turns out, from what I’ve heard from colleagues, male teachers are often terrified of the enigma that is a teenage girl. → This has to be shared. haha, I find this odd, speaking as a male substitute teacher. Like, I've been with a woman before – They don't start spontaneously bleeding and leaking down their legs. One teenage girl once did make a deal out of it, loudly pronouncing to the class, “Hey it's my time of the month, you have to let me go!” I just kind of rolled my eyes and told her to wait, since class was over in five minutes. She had been a snot the entire class period, constantly trying to use her cell phone, and I could tell she just wanted to leave early. Besides, if she REALLY had that problem, she sure as hell wouldn't be announcing it to the rest of the class. I usually ask the student “are you going to pee on my floor?” When they look at me weird and say “NO” then I say “get back to work you don't have to go bad enough!” Then they figure out they have to answer yes before I will let them go! Some will not say they will pee on the floor and they will wait. This is usually witht he older kids. I agree with your scan of the child. We also get notes from the nurse sometimes on kids we cannot deny bathroom use – hard to remember when you have 600 students – and it also creates the but you let so and so go! It is amazing how contagious having to go can be! I was teaching a kindergarten class last year a and one little boy was drawing his version of something or other on the overhead and just had an accident. No questions to go to the restroom, no squirming, no signs at all except for the pee on the floor! To make things even better, before the janitor could get there another girl had a spontaneous nosebleed. And I don't mean a little nosebleed, it was one that leaked all over the floor. But at least I didn't have to call for the janitor twice in a row!